Arthritis of the foot is inflammation and swelling of the synovium, the soft tissue and lining of the joints in the foot. An increase in the fluid within the joints is usually present as well. One or both feet may be affected. Although arthritis is a well-known cause of joint pain, arthritis in the foot or feet may not cause symptoms. On the other hand, some people with arthritis in the feet become disabled and unable to walk. Because the feet bear the weight of the body, it is impossible for arthritis sufferers to avoid the foot pain that accompanies load-bearing, and for this reason the feet seem more susceptible to arthritis than other parts of the body. What Are Some Common Symptoms of Arthritis in Feet? Common symptoms of arthritis in the feet include joint pain or tenderness, joint stiffness or reduced motion, joint swelling, and difficulty in walking. There are 33 joints in each foot, any of which may be affected. The anatomic areas most commonly affected by arthritis are: the ankle (the tibiotalar joint), the hindfoot (including the subtalar or talocalcaneal joint, the talonavicular joint, and the calcaneocuboid joint), the midfoot (the metatarsocuneiform joint), and the great toe (in particular the first metatarsophalangeal joint, which is also where bunions usually develop). What Causes Arthritis in Feet? Osteoarthritis, the most common type of foot arthritis, is a condition in which joint cartilage is damaged as a result of wear and tear that occurs over time. It is also known as degenerative arthritis because it progresses slowly and the associated pain and stiffness generally worsen. Rheumatoid arthritis is an irritation of the joint lining (the synovium) that results when one’s own immune system attacks and destroys cartilage. This inflammatory disease usually affects multiple joints in the body. Post-traumatic arthritis can develop after an injury to the foot, such as a broken bone, torn ligament, or moderate ankle sprain. It may not manifest until years after the injury, and may occur regardless of whether the joint injury was initially treated. To diagnosis arthritis, your doctor will ask you a series of questions about your symptoms, such as where and when the pain began, how often it occurs, and whether it is worse at night or when walking. Your doctor will also ask about past injuries to the foot, and what type of shoes you wear. How is Arthritis in Feet Treated? A diagnosis of arthritis does not necessarily mean that your quality of life will decrease. By seeking treatment early and taking an active role in the management of your arthritis, you can control the pain and limit damage to your joints. 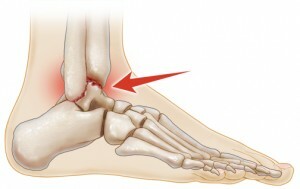 Left untreated, however, arthritis can eventually lead to foot and ankle deformities. For many types of arthritis, aspirin is used as the first-line treatment, and its success or failure can help guide other therapeutic interventions. Treatment can control inflammation and preserve or restore joint function. Surgical intervention may be considered as a last resort if the arthritis does not respond to nonsurgical interventions. After surgery there will be a period of rehabilitation, during which you may have a cast on your foot or have to wear an orthotic shoe or brace. It may be about three to four months before you are able to resume ordinary daily activities. In most cases, arthritis cannot be cured and the disease will continue to progress. Even with the best of treatment, arthritis of the foot and ankle may continue to cause you pain or require you to limit your activities. Severe disability from arthritis is rare, however, and usually seen in persons with rheumatoid arthritis. Frequent use of anti-inflammatory medications is known to cause gastrointestinal upset. People with rheumatoid arthritis are at higher risk for complications, such as peripheral neuropathy, infection, and skin or muscle problems. How Can I Prevent Arthritis in My Feet? Although it may be impossible to prevent arthritis from developing, the conditions that lead to it can be corrected. For instance, if you have osteoarthritis, correcting any faulty mechanics that lead to the joint not moving properly may prevent further joint damage. Wearing proper footwear or custom orthotics prescribed by your podiatrist will ensure that the foot and ankle joints are properly aligned. If you have a rheumatic disease, such as gout, controlling your uric acid level can reduce the incidence of the associated arthritis. What can I do to slow progression of my arthritis? How will treating my arthritis limit my normal activities?